A magical thing has happened. Our new place came complete with a fruit tree, and a kind of fruit I’d been curious about for some time, loquats! It’s a southern thing, apparently. A native of China, the tree fruits in mid- to late spring here in Central Texas. Loquats are also called Japanese plums or Japanese medlars (so says these folks). Addie wrote about them last year, and she even formed loquat awareness week! Check out her latest post for other recipe ideas, like jelly, pico de gallo and a shrub! 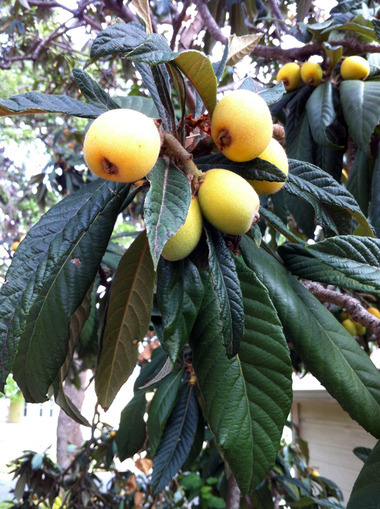 I think the loquat is similar in taste to a plum/apricot mix, and in texture like a mango/apricot mix. They’re delicious in any case and I’ve been popping them as they ripen in arm’s reach. I will say that the yellow ones are best. Once they ripen to their orange-y state, they’re not very flavorful any longer. As the rest of the tree ripened, I did what any preserver ought to do in these circumstances. Climb! When life gives you free fruit. You should eat it, as many ways as possible. I made French-style preserves a la Christine Ferber’s finicky (but worthwhile) preserving preparations with my first harvest. This preserve is essentially just halves in syrup, if you’re looking for more of a jam, pull out your potato masher. 1. Pluck 2lbs of whole loquats then halve them, skin them, seed them. Let this mixture sit at room temp for an hour, covered with parchment or something to keep fruit flies out. 3. Bring mixture to a simmer over med to med-low heat, remove from heat and place back in the bowl. Refrigerate covered overnight. 4. Strain loquat halves out of the refrigerated mixture while pouring out the syrup into a heavy-bottomed, wide base pot or deep skillet. Bring syrup to a boil over med-high heat, cooking the syrup until the bubbles get larger and more spaced out. Time will depend on your pot, but it’ll probably take about 7-10 minutes at a med-high boil for the syrup to thicken slightly. Skim foam if necessary. 5. Add the loquat halves to the boiling syrup and cook for 5 minutes. Remove from heat and ladle mixture into jars. Refrigerate once they’ve cooled down a bit. Turns out peeling loquats, while not difficult, is not that fun. 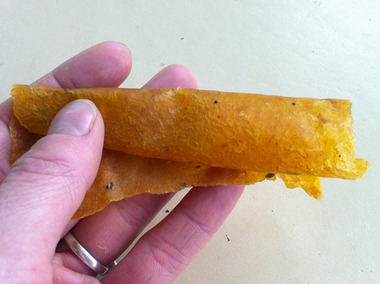 The next project involves a food mill, because why peel when you can just crank the skins off. If you don’t have a food mill you still don’t necessarily need to peel them, but you’ll want to puree the fruits as finely as possible since the skins don’t soften in the cooking process. 1. Seed 3lbs loquats by halving them from pole to pole and place in a stock pot large enough to contain them. Cover halves with just enough water to completely submerge your loquats. 3. Mill your halves on the medium screen of a food mill. I did just one mill, but those of you looking for a fine, velvety, spotless butter, might want to run it through the fine screen after the medium one. Measure your loquat puree, you should have about 3 cups now. 5. Bring to a boil over med-high heat and cook until mixture starts to thicken and the bubbles get larger (about dime-sized) and begin to space out. Stir periodically to make sure the sugar is not scorching on the bottom of the pan. It will likely take about 12-16 minutes for your butter to thicken, depending on your pan and the temp. You can use the spoon test if you’d like. You can also add any spicesor flavor additions, I added a pinch of nutmeg (which ended up a bit heavy-handed in final flavoring, dang), a pinch cinnamon and a splash of elderflower liqueur at the very end. 6. Refrigerate and/or freeze or seal jars in a waterbath canner with a 10 minute processing time. Finally, I made loquat leather at Ernie’s prompting when I chatted with him about my upcoming L.A. trip. He runs a place called The Farmer’s Kitchen in Hollywood. 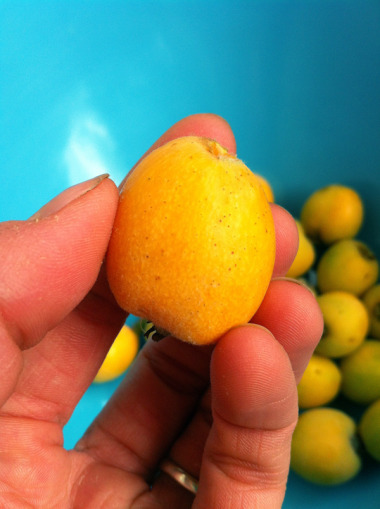 Follow the same loquat weight and process above (steps 1-3) in the loquat butter recipe to get 3 cups of puree. Place puree in a medium-sized saucepan and add 1/2 cup sugar. Bring it to a simmer and remove pan from heat. At this point, add a pinch of cinnamon or whatever spice addition sounds good, if any. Or keep it simple. I experimented with plain, cinnamon, and cinnamon nutmeg (which tastes like pie fruit leather, mmm). Spread onto your drying mechanism or heating vehicle. Cook/dry until there are no more sticky spots that come up on your finger. 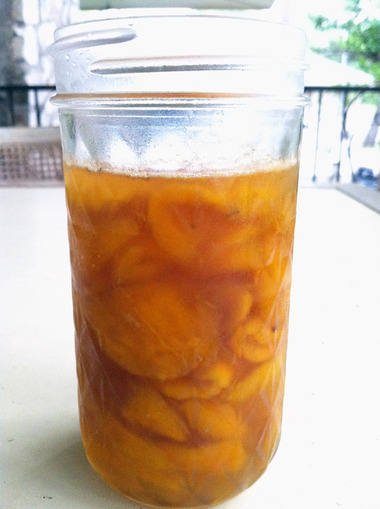 Update 4/20/12: I’ve had a request for how to make loquat syrup. There are a bunch of ways you could do it; here’s how I do it. 1. Take however many loquats you have on hand, halve them and remove the seeds. 2. Place halves in a sauce pot or pan big enough to contain them. Add filtered water to just below where the loquats come up in the pan. Bring to a boil and reduce heat to a med, enough to keep the boil, but not scorch the bottom. After 10 min or so use a potato masher and smash down your loquats. Boil for another 5-10 min, then remove from heat. 3. Mash fruit one more time and then strain solids from the liquid. Measure how much liquid you have and multiply it by .75. That’s how much sugar you should add. 4. Melt the sugar in the loquat juice over med-low heat and then raise heat to med-high to bring it to a boil. Reduce heat and simmer for 5 minutes. Will keep in the fridge for about a week, freeze cubes of your syrup if you’d like for future bevs or projects. Copyright © 2017, Kate Payne unless otherwise noted. All rights reserved.